With the skills routing method, an agent must have the required skills to be eligible for an interaction. The bullseye routing method is similar, however it can expand the agent selection pool if no agent with the required skills is available within the configurable amount of time. You can think of the expansion as a set of concentric rings, similar to the rings on a target, with each ring being a fallback for the previous ring. Each ring is essentially a sub-queue with agents assigned to it. The bullseye routing method allows PureCloud ACD to relax the required skills as the selection pool expands from one ring to the next, with up to six rings. The configuration of a ring specifies the skills to remove from the previous ring. Consider this ring configuration for the example below. A customer interaction requires skills A, B, and C. PureCloud ACD looks at the agents in ring 1. If it finds an available agent within the configured timeout period, PureCloud ACD alerts that agent to the interaction. If none of the agents in ring 1 are available, PureCloud expands the selection pool to ring 2. The selection pool now includes agents 1 through 6 in rings 1 and 2. Skill A is removed from the list of required skills, as specified in the queue configuration. If one of the agents in ring 1 becomes available before a ring 2 agent takes the interaction, the ring 1 agent takes priority over the ring 2 agents. If no agent is available during the timeout period, the selection pool expands to ring 3. The selection pool now includes agents 1 through 8 in rings 1, 2, and 3 and skill B is removed. If one of the agents in rings 1 and 2 becomes available before a ring 3 agents picks up the interaction, then that agent takes priority over agents in ring 3. If no agent is available during the timeout period, the selection pool expands to ring 4. The selection pool now includes agents 1 through 10 in rings 1 through 4 and skill C is removed. PureCloud ACD gives priority to agents in rings 1, 2, and 3 (in that order)because they have more of the requested skills. If no agent is available, the selection pool continues to expand, first to ring 5 and then to ring 6. 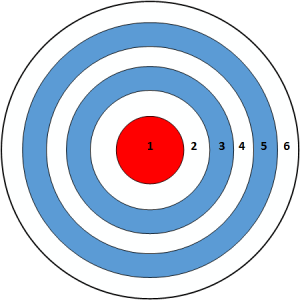 Bullseye routing also depends on the evaluation method assigned to the queue. You can still use the bullseye routing method if you’re not using skills. Using bullseye with no skills allows you to give priority to the agents being evaluated to receive interactions. Evaluation starts with agents in the innermost ring before expanding to the outer rings. For example, you could put the less expensive agents in the inner ring and the more expensive agents in an outer ring. Bullseye routing is not compatible with workforce management scheduling and forecasting.